Wassily Wassilyevich Kandinsky (16 December 1866 – 13 December 1944) was an influential Russian painter and art theorist. He is credited with painting one of the first purely abstract works. Born in Moscow, Kandinsky spent his childhood in Odessa, where he graduated at Grekov Odessa Art school. He enrolled at the University of Moscow, studying law and economics. Successful in his profession—he was offered a professorship (chair of Roman Law) at the University of Dorpat—Kandinsky began painting studies (life-drawing, sketching and anatomy) at the age of 30. Wassily Kandinsky, a lawyer turned artist, belongs in the Pantheon of the 20th century artists alongside Pablo Picasso and Henri Matisse. He earned his Law degree from the Moscow University and lectured at the Moscow Faculty of Law until 1896, then worked as managing director at a Moscow publishing and printing business. At age 30 he changed his life and career completely and moved from Russia to Europe. From 1896-1914 Kandinsky lived in Munich. There he studied art anatomy, drawing and composition under Anthon Azbe for two years. From 1897-1900, he studied in Munich Academy of Art and graduated from the class of Franz von Schtucke. In 1901 he founded “Falanga” artistic movement and school, where he also taught his ideas in art. At that time his paintings represented his earlier impressions from seeing the Russian folk art coupled with his musical imagination. Synaesthetic ability led him to creation of his original style, focused more on series of colors than on formal details. His paintings from that period, like “The Blue Rider” (1903), are steps to creation of the modern abstract art. Kandinsky was the founder and active member of some of the most influential art movements. In 1911 he founded Der Blaue Reiter (The Blue Rider) together with Franz Marc, and included such artists as August Macke, Paul Klee, Alexej von Javlensky, and other painters fundamental to Expressionism. The group held two important exhibitions in 1911 and 1912 touring Germany, for which Kandinsky also included paintings by Henri Rousseau. Kandinsky was the main driving force behind the start of the new movement: he chose artists, collected their works, and published an almanac. In his writings Kandinsky promoted abstract art. He formulated his ideas of spirituality in art, his color theory, and the concept of autonomous color painted apart from an object or form. The start of WWI in 1914 forced Kandinsky back to Russia. There he taught art in Moscow and visited St. Petersburg. In 1916, he met Nina Andrievskaya who became his wife in 1917. During and after the Russian Revolution of 1917, he was involved in art teaching and participated in museum reform. He published an autobiographical book ‘Stupeni’ (Steps 1918). From 1919-1921 he was the Chairman of Russian Art Acqusitions Commission, taught at VKHUTEMAS, and was elected the Vice-President of Russian Academy of Arts. His life in Russia was full of painful and traumatic events. He was devastated by the death of his young son in Moscow. At that time, Kandinsky suffered from another blow from the Soviets when his spiritual and artistic position was bashed and denounced as individualistic and bourgeois. He was under suspicion from the Soviet communists and was eventually stripped from his Soviet citizenship. In 1921 Kandinsky escaped from the Soviet Russia and joined the Bauhaus movement in Weimar, Germany. He was invited by Walther Gropius, the founder of Bauhaus, an innovative school of art and architecture. There Kandinsky taught design and advanced color theory, as well as an abstract painting class. In 1933 Bauhaus was banned by the Nazis. Kandinsky fled from the Nazi Germany and settled in Paris. He became a French citizen in 1939 and continued living and working in Paris during the Nazi occupation in WWII. His studio in Neuilly-sur-Seine, near Paris, was frequently visited by ‘Joan Miro’ and younger artists. He became established internationally through several exhibitions, and his works were acquired in the USA by Solomon Guggenheim, who became one of his most enthusiastic supporters. 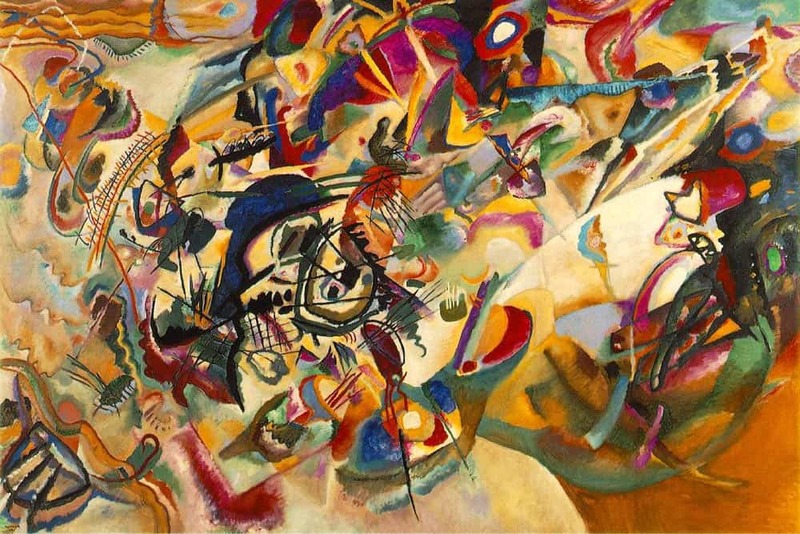 Kandinsky expressed his creative achievements in the series of seven large “Compositions” (1911-39), which are widely acclaimed as the culmination of an abstract style in art. Wassily Kandinsky died on December 13, 1944, in his studio in Neuilly-sur-Seine, France. He is recognized as the developer of Abstractionism in modern art. Kandinsky would remark later that, even as a child, the colors of nature dazzled him. Both music and colors would have a huge impact on his art later in life. Kandinsky’s early paintings were landscapes that were heavily influenced by Impressionist artists as well as Pointillism and Fauvism. The most famous of his early works is The Blue Rider which he painted in 1903. About 1909 Kandinsky began to think that painting didn’t need a particular subject, but that shapes and colors alone could be art. Over the next several years he would start to paint what would become known as Abstract Art. Kandinsky was one of the founding fathers of Abstract Art. 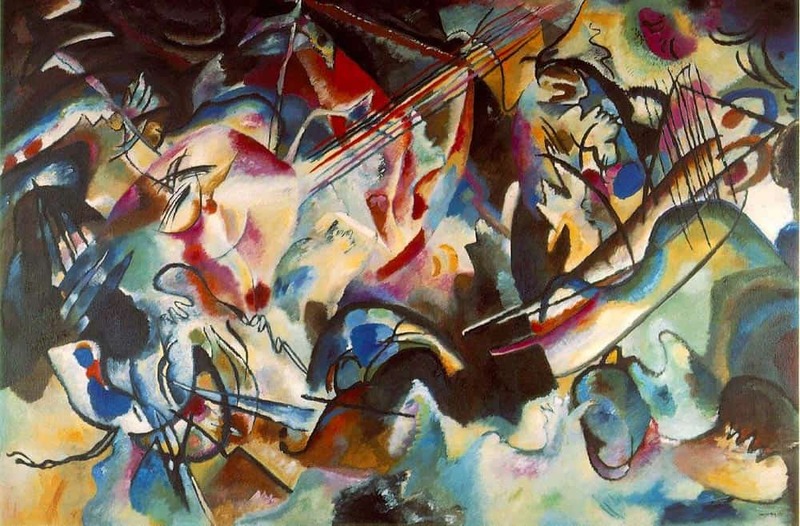 This painting is an example of Kandinsky’s Abstract Expressionist art. He planned the painting for six months and wanted it to represent a number of feelings including flood, baptism, destruction, and rebirth. When he finally went to paint he was blocked and could not paint. He finally resorted to repeating the word “flood” over and over again and began to paint. He finished the painting in three days. In 1911 he wrote an essay called Concerning the Spiritual in Art. He described three types of paintings including “impressions”, “improvisations”, and “compositions”. Many of his paintings were named using these titles and a number. 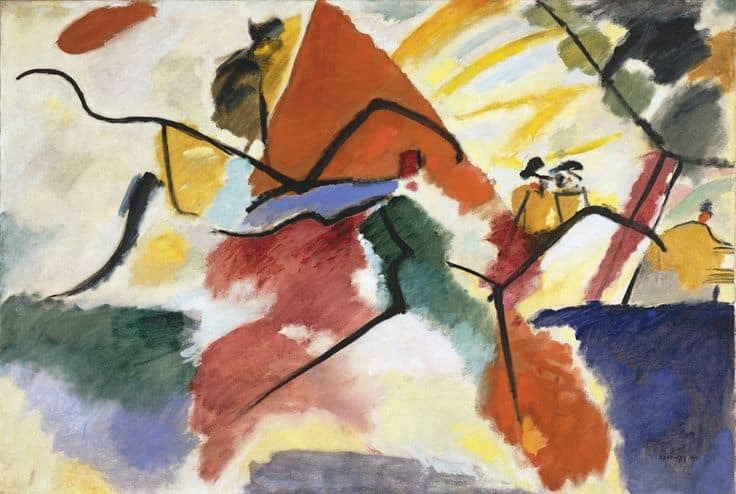 Some examples of this include the paintings Composition X and Impression V.
If Kandinsky wasn’t the first abstract artist, he certainly was one of the founding fathers of the art form. His art and essays on art have had influence over many artists during the last century. He once said that “Everything starts with a dot”. About abstract art he said that “the more frightening the world becomesвЂ¦the more art becomes abstract”. He named the paintings he considered the most accomplished “Composition”. He only named ten of his paintings this way. The all-important spark of inner spiritual life is at present only a spark. The more frightening the world becomes … the more art becomes abstract. The artist is not a ‘Sunday child’ for whom everything immediately succeeds. He does not have the right to live without duty. Every work of art is the child of its time; often it is the mother of our emotions. The spirit like the body, can be strengthened and developed by frequent exercise.